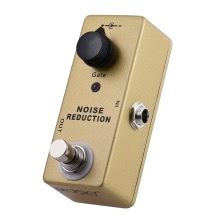 The Noise Gate reduces the noise level from the effect chin, eliminating hiss and excess noise. With a single gate knob to set the volume threshold. True bypass switch for providing clearest tone. Designed with a single gate knob to set the volume threshold. Reducing noise capability up to 26 dB. True bypass switch providing clearest tone, with a LED indicator to state working condition. Single 1/4″monaural input and output jacks, 9V DC adapter power supply. The DC adapter not included.